Yea, I used the word, but ONLY because I love the name my family has for this dish. So, you know how in cities people have funerals and then a meal at a resturant or at their home right? Well it is different in small town USA. Growing up in a small town, when someone passes away, after the funeral they have a luncheon. This luncheon is often a main dish such as ham and a side dish, like scalloped potatoes, prepared by the church women. In my church it was the Altar Society! I still get a little pit in my stomach when I think of some of those ladies. Scary. I thought you had to have gray or silver hair to be in that "club", turns out, you don't! Anyway everyone else is to bring potluck type dishes. Many times the whole town pitches in and this is how funeral lunches go in small town USA, ok Nebraska USA. My mom would ALWAYS made this for funerals, so it was dubbed many years ago "Funeral Casserole" in my family. Thanks to the wit of my sister Sue, it later became "Dead Man's Pie". After deciding it was to traumatizing to her children she went back to the old standby name. LOL Anyway, this casserole is a staple or was a staple in many households through the years. My mom made it plain, hamburger, green beans, mushroom soup and tater tots. Oh yea, the tater tots. 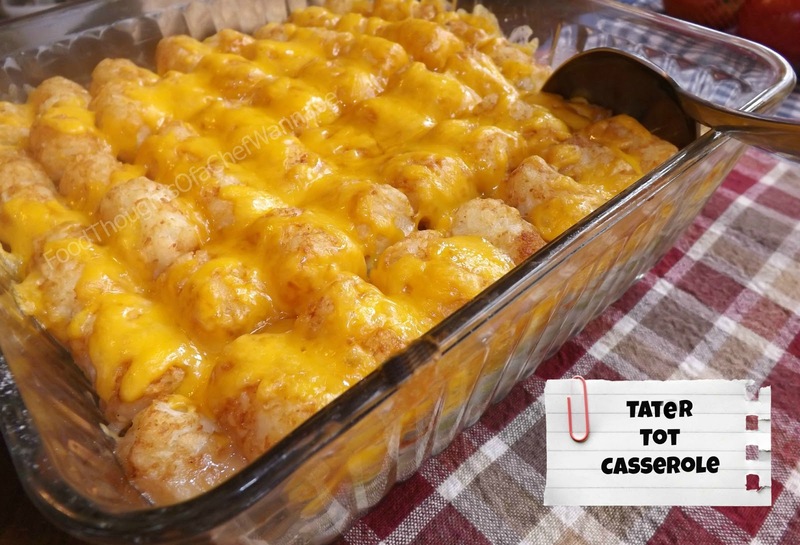 I swear, my mom used to measure the casserole dish, divide it by the size of the tots and how many she had to make sure she had PERFECT lines, and not a single spot left uncovered by the tot! One time, I just threw the tots on top. She hasn't been the same since. See what I mean? I have added cheese on top of mine, you don't have to. I also added some seasoned salt to the hamburger because honestly, it feels a little bland if you don't. Cheese is my new staple on this dish, should I decide to purposely make it again at some point in my life! This recipe makes 1, 8x8 or 9x9 pan. Simply double the ingredients for a 9x13! Preheat your oven to 375 degrees. Place hamburger in the bottom of your baking dish. Using your hand or a spoon, spread it evenly to cover the entire bottom. Salt and pepper, (if you choose) and sprinkle your seasoned salt of choice over. I like the ground beef to have some flavor instead of...."blah, ground beef, woohoo". You know what I mean? OK, good. Next, in a bowl combine green beans and mushroom soup. My mom never did this, but I do, I find it aggravating to try and spread the soup on the green beans. Cut out the madness friends, just mix them together! Now, spread that mixture on top of the ground beef. Now, according to Marlene (my mother) at this point, you arrange the tater tots in a near obsessive compulsive manner. You line up the tots, evenly and those lines BETTER be straight. Got it? (just kidding ma, kinda). You could add a little salt and pepper and seasoned salt or one or the other, or nothing at all to the top. I don't do bland, so I like adding a little flavor to every layer. Enjoy this easy, great for making ahead or freezing C-word! HA! I haven't made this in years, might be time to do it again. I use home raised and butchered ground beef, it is almost completely fat free so that isn't an issue but I can understand wanting to drain it. Sounds awesome, let me know if you make it!! What would you suggest for frozen tater tots if I usually do homemade fries? Could I just cube my potatoes like for salad??? I would suggest cubing them and maybe parboiling them about 5 minutes, or fry them for a few minutes, you will still get that crispy bite!! The Alter ladies in Ohio made this also. Yes your casserole had to be straight or it would be served from the kitchen instead of sitting out on the buffet..I had to smile at the memory. omg i haven't made this in years; I remember when my girls were younger I would make it and not have any left. Gonna make again soon and with cheese; thanks. This was a weekly regular when I was growing up!! Glad you are going to make it..........WITH cheese! HA! I made this for the double batch and put it in a regular 9x13 pan. It boiled over and started a fire in my oven. What a mess. I used the lean ground beef. Next time I might cook the meat first. OH NO! I always put a large cookie sheet under my casseroles for this reason! Hope all is well in your oven and you were unharmed! Thanks for reading Chefwannabe!